Are you ready for the thrill of 360° zorbing fun? What are Human hamster balls? 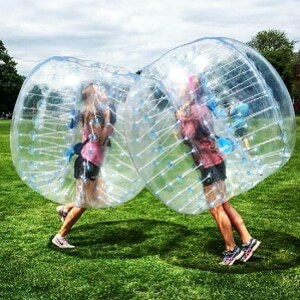 Giant Human Hamster Balls are the perfect addition to any adult or kids birthday party, company team building event, fundraiser, festival or special event. You'll get inside a giant inflatable ball and run, flip, bounce and roll in your own personal zorb ball! You can flip over, race other players, play tag, and more. Our team will deliver, setup & handle all the details of your event. 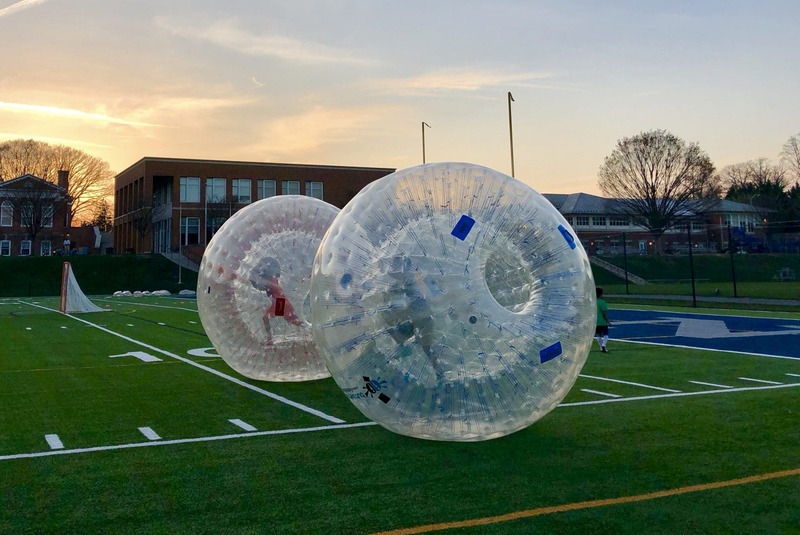 Book online or call (844) 344-2867 to reserve your human sized Hamster Ball event today and start zorbing like you're in your own human hamster wheel! To start, you'll take off your shoes and crawl through one of the two openings in the Giant Inflatable Ball to get inside. All players must wear socks while in the Hamster Ball. Making sure that the two opening stay on your sides, start crawling, walking or running in the direction that you want to move. You can even do flips and tumbles to get the momentum going. We have some great games that will make you feel like a giant hamster. A few of our favorites are team relay races, drag races, and tag. Submit an online request or give us a call today to learn more! 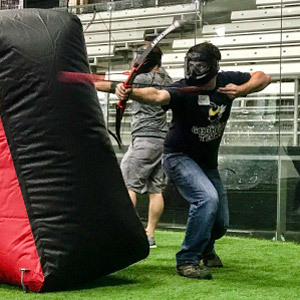 Includes BubbleBall pricing, locations, game info, and more. 98% of reviews rate Wonderfly Games 5-stars! Choose from our most popular packages below OR create your own. Delivery is always free up to 80 miles and we never charge any hidden fees. Add our brand new inflatable human bubble track to your order today! It is perfect for parties, festivals, company picnics, special events, and much more. Measured at 75' long and 20' wide, it can be used on grass, gym, turf, concrete, and asphalt. Call us today at 844-344-2867 to reserve the inflatable Human Hamster Ball Track for your next event! 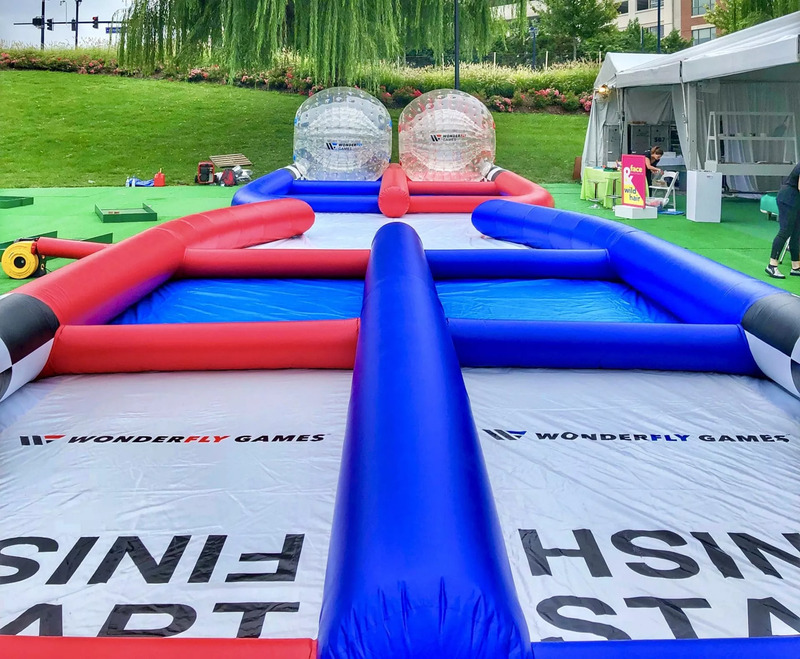 Our giant inflatable Balls can be used indoors or outdoors year round and can be played on grass, artificial turf, basketball courts, and on parking lots if you rent the hamster ball track as well. 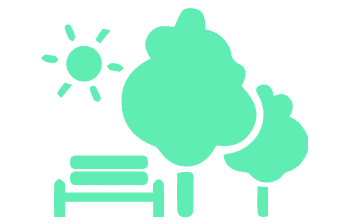 Don't have a location? No need to worry. Just submit an online request or call us at (844) 344-2867 and we can help you find a great spot. "Our group had a total blast with the hamster balls. The kids and adults couldn't stop laughing." Whether crawling, spinning or walking, you'll have a blast rolling around on just about any surface. For even more fun, add a second zorb ball to create competitions like relay races and tag. Our giant hamster balls are big enough (and safe enough) for both kids and adults, it's like nothing you've ever experienced! Are you ready to join thousands of happy kids, teens, parents, and companies who have experienced the thrill of rolling full-speed at birthday parties, corporate events, summer camps and more. 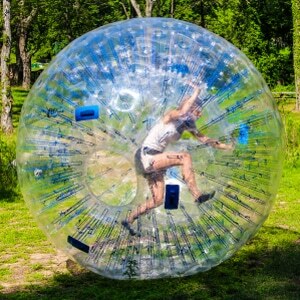 Climb into one of our huge ten foot hamster ball zorbing spheres today! Zorbing was created in 1994 in New Zealand by ZORB® and the first zorb ball track was installed in Stien Vermeiren, Bay of Plenty. It's essentially a big inflatable ball with double-harness spheres. This allows you to roll or run inside of it. 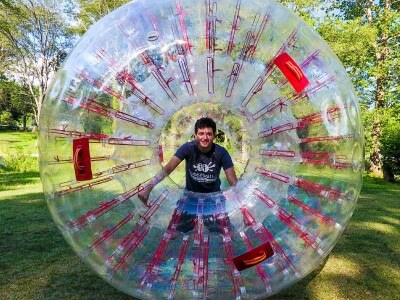 Zorbing and human hamster balls are available all around the world. Wonderfly Games delivers throughout the Mid-Atlantic region of the United States and has partners all over the United States as well. 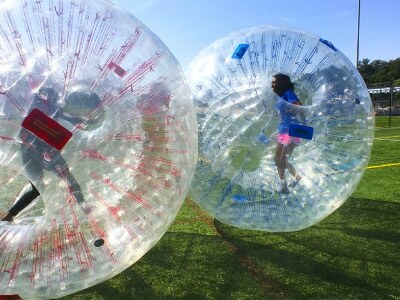 ​Zorbing ranges in cost from $5 a person up to $100. The price depends on where you are playing​ and how long you want to play.